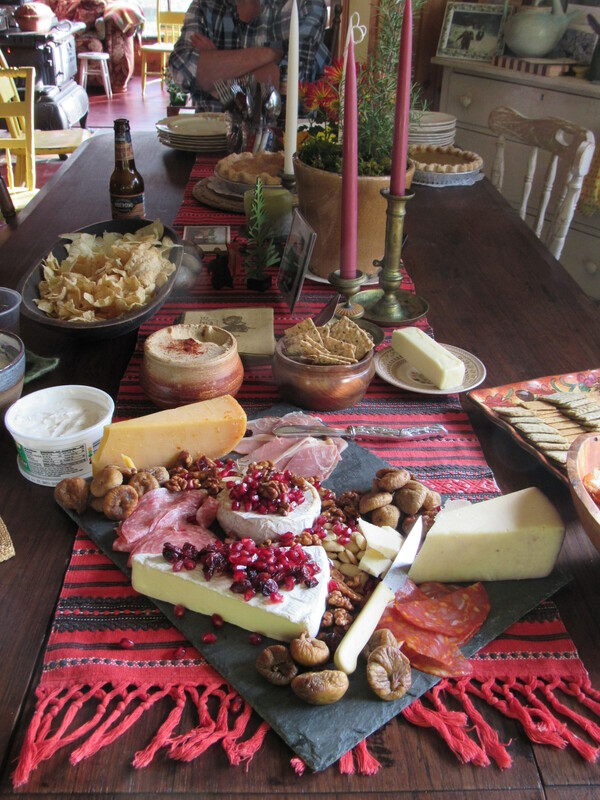 Always cook more food than you think you’ll need for your Thanksgiving guests. Even if you are feeding twenty, prepare for at least 35. You want to know why? For days after that feast, you won’t have to cook a thing!! You just leave a stack of clean plates on the counter, remind everyone that they’re responsible for washing their own dishes, and then go and relax. 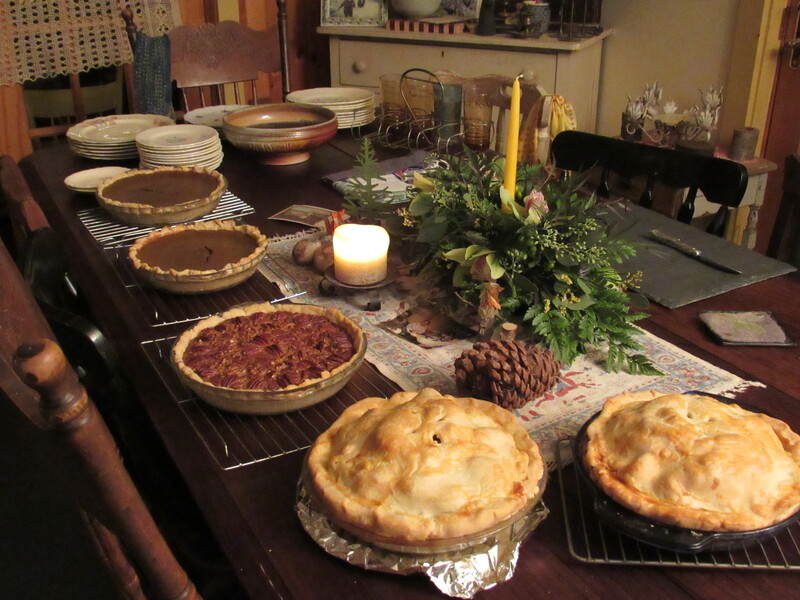 Or eat more pie. Or stack more wood, in my case. Then eat more pie. 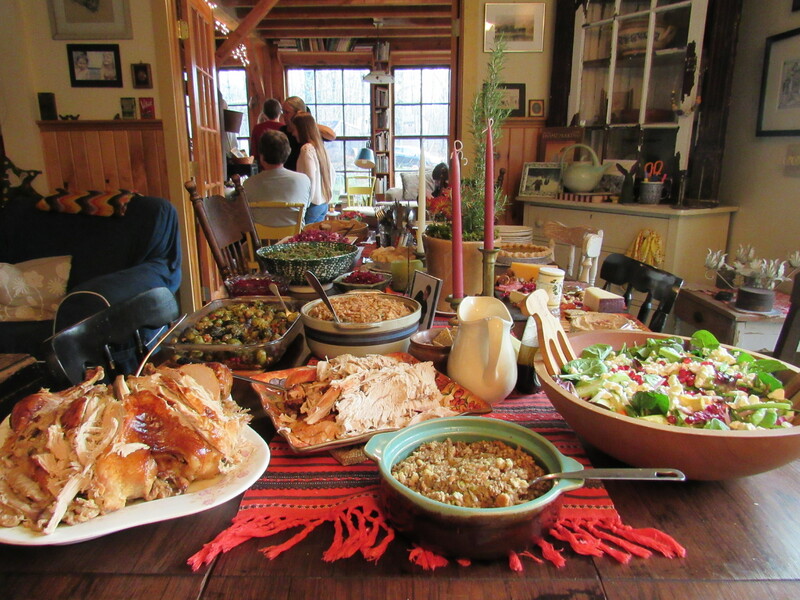 Twenty people did show up to eat and enjoy the day. Even our wonderful WWOOfer from New Hampshire came…..how great to have helping hands during the summer, and to then have them travel back to enjoy the harvest. We would have also loved to have our other amazing WWOOFer here as well, Cristina, but traveling from Italy for a meal was probably out of the question. Maybe next year. Someone Has Beaten Me to It……. For all of those who read our last post regarding the chickens and their yearly molting process…..knitting sweaters for all the Henny Penny’s in the chicken coop isn’t completely out of the question. A reader sent along this site to confirm that some chickens are truly pampered! Moments ago a neighbor up the road called to see if we had any extra eggs. ” Not at the moment”, I said, “the hens are molting and we’ve just put a light in the coop a few weeks ago”. The light is to extend the length of day, now that our days are getting shorter. Chickens need at least 14 hours of light a day to stimulate egg production, a light bulb in their coop helps with that. Molting also happens every year as the days shorten and the temperature cools. The chickens will shed their old feathers and begin to grow new ones, most often they stop laying while this is happening. 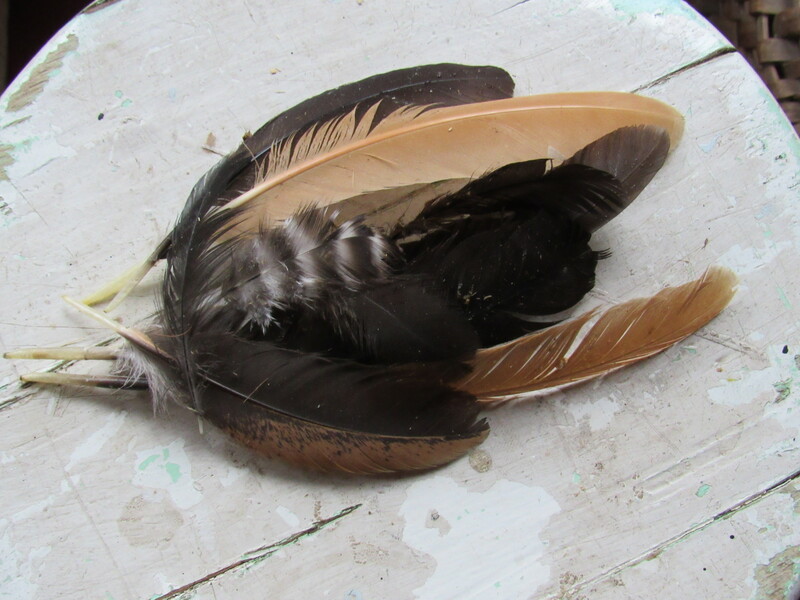 The length of time for the new feathers to grow back in place varies from bird to bird. A lot depends on their diet. It takes a lot of energy to grow feathers ( feathers are mostly protein), so keeping them well fed and watered is important. For some birds their feathers will grow back in about 4 weeks, for others it may take up 6 or 8 weeks. Right now the inside of our chicken coop looks as though a major pillow fight has taken place. That’s kinda fun to imagine actually. We rake them up with the shavings and dump them into the compost piles. Feathers are fairly high in nitrogen, although they can take a long time to break down and to release the nitrogen into the soil. Always thinking about soil here, yes we are! The gardens are now pretty well put to bed for the winter. Most have been covered with a nice layer of semi composted leaves. In the vegetable gardens, a few things continue to hang on…the kale, some chard, and several rows of carrots. The hoop house continues to produce some fresh greens. Soon however, the last bunch of our ram lambs will be occupying that structure, they’ll put an end to any green growth for sure. How is it that we’re nearing the end of November already? Perhaps we’ve been tricked with this incredibly warm Fall weather. Maybe I thought September was lingering ( where did October go?) and that we still had months ahead before cold and snow. Let’s just hope those ladies in the chicken coop get their feathers back before a good Nor’easter blows in. I could knit them sweaters, I guess. If I ever find the time to knit sweaters for twenty naked chickens, I’ll definitely post pictures…… but don’t hold your breath waiting! Recently a customer of ours stated that with climate change, and the warming of our seasons, that shade gardening will become more popular as a way to continue gardening in the heat. Interesting thought. Of course, trees are an integral part of that concept. We can’t really garden in the shade without shade! Living among a forest of trees here, rambling the woods on a regular basis, and being what we would consider ( aside from gardeners and farmers) stewards of the forest, we pay close attention the the health and changes of the woods around us. Many studies show that the eastern forests are in decline, and in some cases it is happening quite rapidly. So many plants in the understory rely on that canopy of shade. Think of all the woodland flowers that require just that….a woodland habitat. Most of the plants we grow here are shade loving, and without the trees that we have, they would suffer. Indeed, gardening in the shade on hot days is much more pleasant to some people than being in the sun. One of the very reasons why we prefer shade gardening……no big fans of the blistering heat here at Fernwood! But what about the trees that provide that shade? As an example, in some areas the beech trees are dying at a rate of 10% per year. The ash in our area took a hard hit during the ice storm of 1998, and have been very slow to recover. Of course, there is also a yellow ash fungus that is contributing to their decline. The uncertainty of the forests and particular species of trees is a worldwide problem. The major culprit, that will do the most damage over time, seems to be air pollution and ozone. Acid rain and other chemicals poison the plants and the soil, while ozone interferes with a plant’s ability to feed itself by literally bleaching leaves and needles. This reduces or eliminates chlorophyll production and the tree can’t feed itself. If this alone does not eventually kill them, the trees become weakened and more vulnerable to disease, stress, and pests. Some trees can tolerate more pollution than others, but most will suffer over time as conditions become more stressful. We love our woodlands and everything that lives in and is dependent on them. We’re sure most people do. Without trees, everything in and below the canopy can perish. All are connected, plant and animal alike. It saddens us to think that someday the forests as we now know it may be gone……and not simply due to natural forest evolution. This is very different than that. If action, strong action, isn’t taken soon, our fears will become a catastrophic reality. A world I cannot imagine. Damage to our forests from pollutants was documented in the 1950’s. Governments are talking about reducing pollutants to 1990’s levels. That would be too little too late, and if so, we may reach a point that is irreversible. Let’s hope that the powers that be can move faster and with determination to save the world, our only world, from such a disaster. 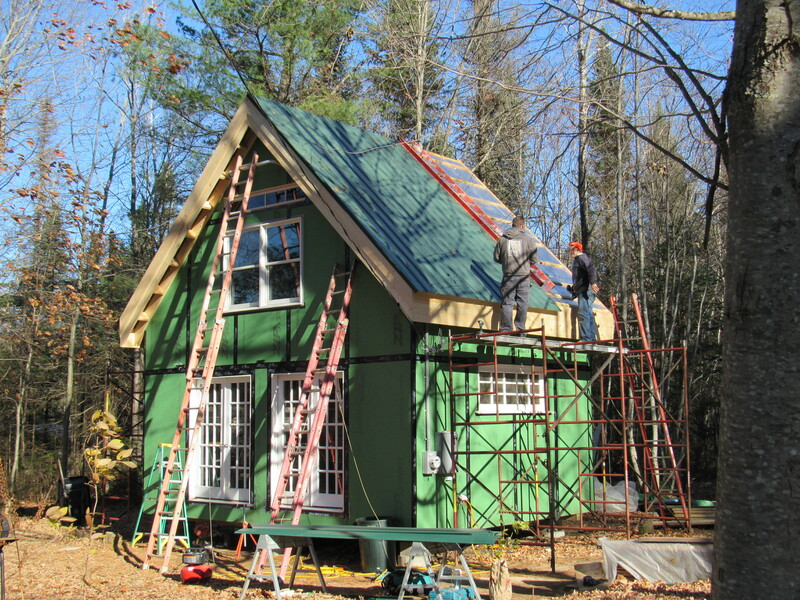 This weekend we put the metal roofing on the studio building. The studio has been one of the summer/fall projects we’ve been working on. Why do we need a studio here at Fernwood? Having a building to give more lectures and classes will be a great help. Rick will certainly offer up more horticultural classes, talks on specific plants or groupings of plants, and hands-on workshops. Over the last few years, people have requested more ‘talks’ and workshops that focus on the native and woodland plants we grow, shade gardening, and a multitude of other gardening/farming/ and craft related topics. Of course there will be lots of wool dyeing, felting, knitting, and art classes available, that’s just a given…..and completely indulgent on my part! Now that the roof is on, we’ll be focusing on the inside. This next weekend the woodstove will go in to allow us to work comfortably throughout the next month. A bit more wiring, insulating, and trimming out windows are next on the list. With hopes ( and well wishes!) the studio will be ready by January. We’re planning on a mid week yoga class taught by a friend of ours. A writing workshop has stirred some interest…..winter being a great time to indulge in the craft of writing. Rick has agreed to a winter walk and plant identification class. Part of the excitement has been in developing a line up of class possibilities……and suggestions are always welcome! We’ll certainly be listing class offerings as we get closer to finishing up the construction……stay tuned! We have been blessed with an incredibly warm and beautiful Fall. A little rain here and there, just enough , I would say. A few cold and cloudy days, days we’re happy to come in to enjoy the warmth of a fire in the woodstove. What I like best about Fall is the pace. A big list still sits on the table, I’m afraid we’ll never be without a big list. But the way we go about tackling the tasks does seem less intense. Perhaps our bodies (and minds) are naturally winding down for the restorative season of winter. The days begin with a little less urgency……we wait for the sun to come up, we have a second cup of coffee, we look over the days work and make a plan. Right now, the very last of the firewood is being stacked ( some for next year, too!). 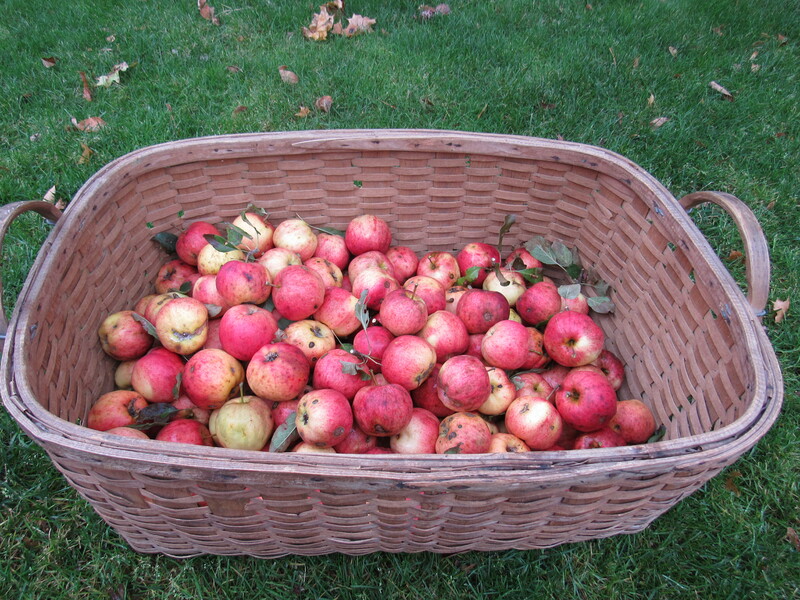 More apples are being pressed for a winter’s supply of cider. Some of the gardens are being cut back and the soil amended. The animals are all being brought home to their winter lodging. The studio will have it’s roof on this weekend, the wiring done, and we’ll insulate the loft area. More yarn is being spun and dyed. Yes, there is a hefty list for sure, but I am enjoying the fact that we are not feeling so frenzied with having to cross off an entire list in one day. I want November to linger, I want to feel everyday as a gift of time. Perhaps the slower pace of these Autumnal days allows us to be a bit more present in our world, I like that. So off I go, list in hand and with no terrible urgency, to pay attention to my day! I hope you are all enjoying these beautiful days of Fall!